A second year high school student who works as a butler for the Suzutsuki family. She dresses like a male due to the family circumstance of a must to have a male from her family to serve Kanade's family. 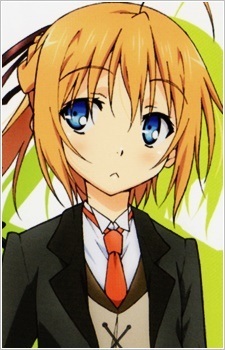 Because of her being the only child, she has to cross-dress and Kanade's father only allowed her to be her butler if she could spend the entire 3 years at school with her true gender undiscovered, her physical features makes her believed by everyone to be a boy until one day, Kinjirō Sakamachi accidentally discovers her secret. She is in love with Kinjirou and attempts to confess to him in novel volume 5, but because of her shyness it came out as "want to be friends." After telling Kanade that she confess to Kinjirō, but because of her shyness she failed, Kanade promised to help with Subaru's confession. Like Kinjirō, she enjoys instant noodles and is also a fan of the popular "Lost Sheep" series of plush dolls. During the later events of the novel Subaru realizes what is truly important to her and that being her affection for Jiro and thus apologizes to Kanade and tells her she can't be her butler anymore. Subaru then proceeds to reveal her secret to everyone at school. Jiro then at the end of volume 11 proposes to Subaru to which she accepts and they are engaged. In the last volume they officially start dating.